Red Fox, a photo by megan_n_smith_99 on Flickr. I had a nice day yesterday running some errands with friends. Running errands is generally more enjoyable with friends. We explored the maze that is Ikea. I'd actually only been there once before. I did not get anything but I looked at picture frames for future reference for shows. Then I finished this painting last night. Today I am starting a larger painting - 10 x 20 inches. It's on a paper that is new to me, though unfortunately I am not sure what it is, a friend gave it to me. I should have labeled the sheets w/ post-its. I could possibly identify it by texture if I saw it again, though. I hope I like it! I am going to paint while listening to the audio book of American Gods by Neil Gaiman. And hopefully I will also do some chores. 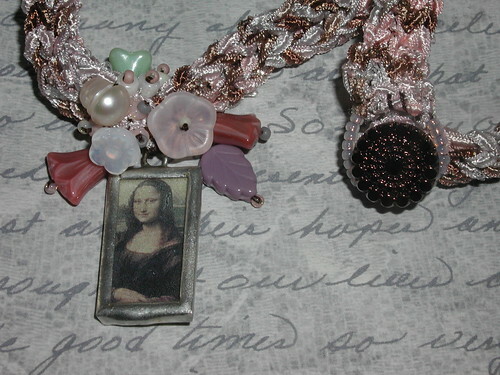 mona lisa necklace, a photo by megan_n_smith_99 on Flickr. This week has seemed so long. I had either a cold or bad allergies for part of it and was so tired I slept a lot. I went to a funeral for a family member on Tuesday. It was nice to see family - some I had not seen in years - but also a sad occasion. I've made a few more necklaces this week, and 2 iphone / phone cozies, which you can see on Etsy. 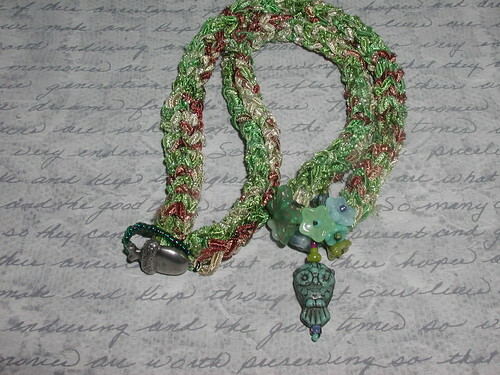 This one features a hand-made glass Mona Lisa pendant on a knitted necklace, acceted by flower beads and a freshwater pearl. The closure is a glass button. It's very pretty and delicate and I think it would look beautiful with a spring dress. Owl Necklace, a photo by megan_n_smith_99 on Flickr. I've listed three necklaces on Etsy. 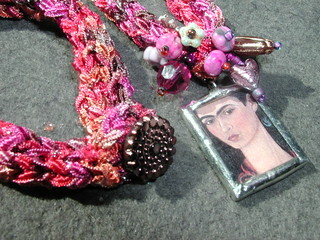 An owl necklaces, seen here, and a Frida Kahlo necklace, and a really pretty delicate blush pink and ivory necklace. I've been getting a lot of ideas lately, for paintings and for jewelry, and it takes a lot of time to experiment and see what works and what does not work. So this week has been a little bit maze-like for my art. Sometimes I feel frustrated if ideas don't work or if i feel like i am not making some sort of progress, and other times i can let go and enjoy the process. i am hoping today is one of the letting go days but we shall see. Heron Along the Shore, a photo by megan_n_smith_99 on Flickr. This is my latest creation. I've been using a lot of blue lately. This is Daniel Smith's French Ultramarine. I never seem to get tired of painting Herons, either. I've been painting a lot of birds this year, but I think I may paint a few mammals now. They feel under-represented. Also I've been working on some new jewelry designs - I'll be sharing some images soon -- maybe later today, we'll see what I get to today. Frida Necklace, a photo by megan_n_smith_99 on Flickr. Oh, I do so miss my old Fuji camera that died. It was old, it paid its dues. It had a long and happy life but eventually the little gears that moved the lens started to strip and it stopped focusing. It's certainly not the time to buy a new camera. So I am using a camera a friend of mine retired, an old Olympus, and I have just never learned its tricks. Add to that the unreliable quality of the light (or lack thereof) in Seattle and I just am not getting pictures as good as I would like. Plus, really I'm not a photographer. I have an eye for to composition of a shot but lack the technical know-how to really get what I want. Perhaps when I am able to get a new camera I will take a class. Enough whining! Sorry! I've been working on some necklaces and will be listing them for sale when I've sorted some details out and gotten better pictures. This necklace has a knitted base, a gorgeous variegated ribbon yarn that wanders from fuchsia to rose to salmon, accented with a flash of silver. The clasp is a button and loop. The button is a Czech glass button. The focal point of the necklace is a soldered charm of a detail from one of Frida Kahlo's self portraits, accented with glass and crystal beads. Peacock in Orchard, a photo by megan_n_smith_99 on Flickr. I can't remember what grade we learned this poem at school, probably 6th grade. 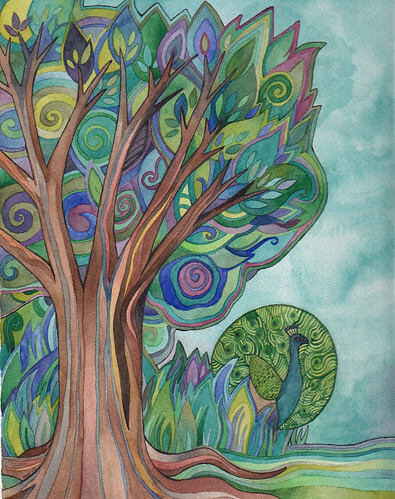 And I think I agree that trees are nature's poetry. No pun intended! The trees in Seattle have been getting a good long drink this week, with all the rain. I am looking forward to "May Flowers" - though actually there are quite a few April flowers out at the moment. I seem to spend too much time talking about, and thinking about, the weather. How human! Let's see, what else is new with me ... I went to a workshop at Worksource, a WA State agency that partners w/ WA State unemployment to help people find jobs. Learned a few things. Of course it would certainly help if there were more jobs available in my field. I am thinking of switching fields. I don't really want to but sometimes one must make choices like that. The thought of going back to school at age 41 is not entirely pleasant. And I will keep trying to make a go with my art as well. In addition to painting, this week I've been working on some new jewelry ideas that are somewhat unique - it's hard to find unique ideas in that arena because so many people make jewelry using the same basic techniques but I think I may be on to something! Maybe I will take some pictures later today or tomorrow. Perhaps there will be some more light later! It's a bit of a concern in my parts! Raven Sings the World Alive, a photo by megan_n_smith_99 on Flickr. I've been painting birds lately. And I'm not done yet, either! Spring must be inspiring me to pull out the bright blues, mossy greens, and delicate violets. 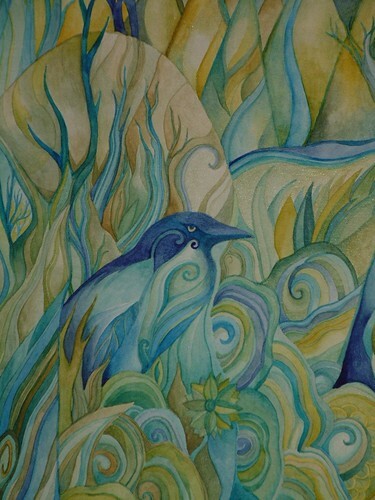 I just listed 3 on Etsy, a heron, a raven, and a peacock. 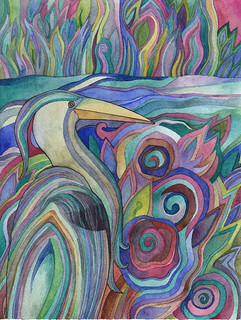 I've always loved herons, and used to watch for them on my school bus growing up, as we traced the shoreline. Crows are everywhere in Washington State, and Ravens are not uncommon either. In the winter when everyone else heads south, there are still crows and gulls and other seabirds. Unfortunately there are not a lot of peacocks wandering about, other than at the zoo, where they pretty much go wherever they please. 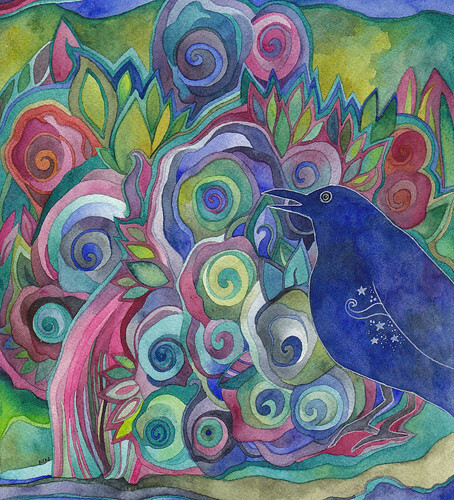 I think there are a few feral peacocks on Vashon Island, where I grew up, but none of them lived near our farm. The winner is Tania from PDX. Tania if you are reading this can you email me your mailing address? 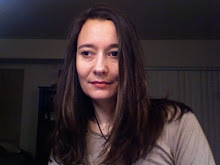 There are email links on every page of my website: www.megannoel.com. Stay tuned for another chance to win next month! Ravenwood, a photo by megan_n_smith_99 on Flickr. My paintings at Capitol Hill Presbyterian Church, a photo by megan_n_smith_99 on Flickr. Please excuse this iphone photo! 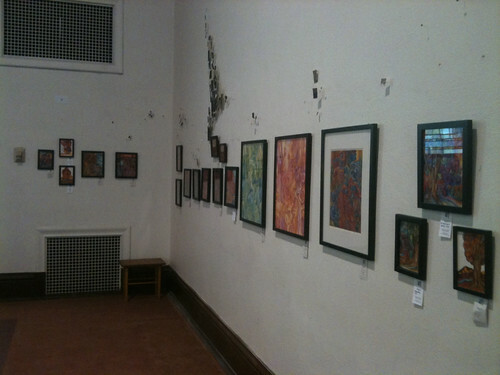 These are some of my paintings hanging at Capitol Hill Presbyterian Church in Seattle. They'll be up for the month of April. The Church office is often open during the day if you'd like to stop by, and of course the church is open Sundays. I was there this evening as part of the Capital Hill Art walk, and it was nice to meet some new people! The church is a beautiful old building. My paintings are actually hanging in the back of the sanctuary. The smaller paper fragments on the wall are part of a permanent installation by artist Robroy Chalmers. It's been a beautiful sunny weekend. Yesterday I lay in the sun and read and later painted by my sunny window. I finished Tim Power's latest, Hide Me Among the Graves. It's a sort-of sequel to The Stress of Her Regard. Only Tim Powers could combine Shelley, Lord Byron, Queen Boudica, Christina and Dante Gabriel Rossetti, ghosts, and vampires - and set it under london - and make it just about plausible. A wild romp indeed. And I am listening to the audio book of Little Big, as read by the author, John Crowley. The audio book just came out. I love Little Big and it won the world fantasy award in 1982. This version is a version sort of edited by the author, I was sort of surprised because my copy was the original, and part of me wants to go through and document all the differences but fortunately I've resisted the urge. Today I went to visit my friends the Backmans for Easter. It was fun watching the kids hunt for easter eggs and then watching them see how much sugar they could consume before their parents put the breaks on. I still do not know how people manage to be parents 24/7! 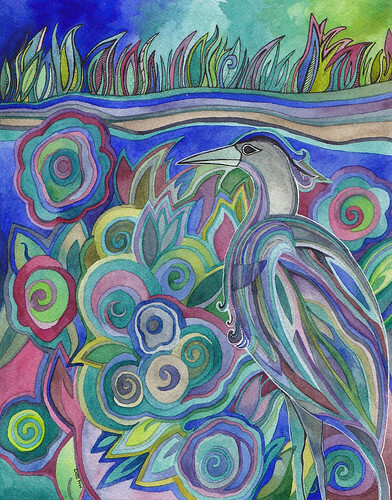 This Heron is my most recent painting. Coelacanth, a photo by megan_n_smith_99 on Flickr. It's time for the April give-away. Leave a comment for a chance to win this little painting. It's 4 x 6", actually it's a postcard, so you could send it as a postcard, or you could frame it, or hang it on the fridge - it's up to you! Comment by Saturday April 14th and I'll pick a winner then. Also, I've listed a new trilobite drawing on Etsy. Under Ancient Seas, a photo by megan_n_smith_99 on Flickr. I found out on Monday that I am anemic and short on vitamin D. I've started taking supplements and I hope it helps! All this year I've been getting out of breath so easily. I finished this painting - Coelacanths and ammonites and trilobites and cuttlefish - oh my! It's available on Etsy. Yesterday I babysat, and the kids were really pretty good and I tried to be fun and play with them even though I just wanted to lie on the floor. The little boy might have been convinced to take a nap on the floor with me but the little girl seems to have forgotten how wonderful naps are. And then I went to Daniel Smith and used a gift certificate I had been hoarding. I got some colored pencils, a few brushes and markers, and a watercolor block because it was on sale. I am set for paper for a while. When I was young, maybe 5th or 6th grade, We had a book shelf in the room which anyone could borrow books from. They were mostly scholastic paperbacks. 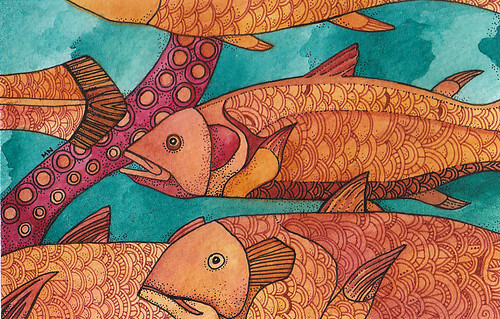 There was one about the Coelacanth - that was my 1st introduction to those strange creatures. Here is a snippit on them from wikipedia, "Coelacanths belong to the subclass Actinistia, a group of lobed-finned fish that are related to lungfish and certain extinct Devonian fish such as osteolepiforms, porolepiforms, rhizodonts, and Panderichthys. Coelacanths were thought to have gone extinct in the Late Cretaceous, but were rediscovered in 1938 off the coast of South Africa." 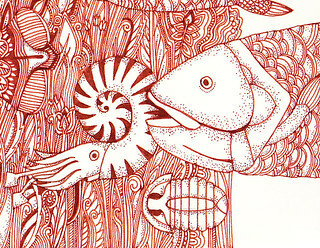 Here is a detail of a pen & ink drawing in progress. 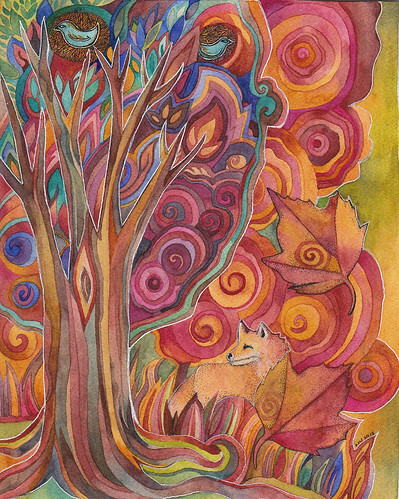 Actually, I think I will be doing some watercolor washes over it. It's going to be 6 x 15". The paper is L'antica Cartiera Tecniche Miste 140lb, cold pressed / grain fine. I generally prefer something with a bit more tooth for watercolor but this smoother paper is quite nice for pen and ink and I think it will work out ok with light washes. In this detail you can see a coelacanth, a trilobite, and an ammonite.